karlssonwilker’s work with the Museum began by redesigning the materials for their annual “Salute.” This black-tie gala presents a lifetime achievement award to a leading member of the industry. It also serves as a fundraiser to support the Museum’s youth outreach and educational programs. Following the work with the event, we were asked to take on the museum’s rebranding in tandem with the signage and wayfinding for the renovation of the existing building and construction of the museum’s new 65,000 square-foot extension and courtyard. Before renovation in 2011, annual attendance was at 90,000. It currently stands at 250,000. To inaugurate the Museum’s new 50-foot-long Herbert S. Schlosser Media Wall in 2016, we created the audio-video projection “Vicissitudes.” Over time, we will add more virtual universes to this ever-expanding project. Architectural rendering of the expansion exterior from Leeser Architecture. As the natural light changes, so does the atmosphere of the Museum’s interior. Our team worked closely with the museum director and the architect for this project, Leeser Architecture. The new rear façade of the Museum, about 200 feet long, features a surface pattern of 1,067 triangular panels. These thin aluminum panels are mounted on an underlying support structure, allowing light and rain to filter through. The expanse of light blue metal is punctuated by the negative space between the pieces. This became the starting point for the typography that resulted in three fonts and extended to the Museum’s logo, marketing materials, exhibition text, and exclusive merchandise for the Museum’s store. These items range from t-shirts and mugs with irreverent film references, to wayfinding and donor wall, tickets, and menus. This approach had the in-house design team in mind, so as to be easy to implement the identity across a variety of mediums by utilizing the three different typographic voices. Apart from the three custom headline fonts: Daily, Alternate Ending, and Director’s Cut, Benton Sans (The Font Bureau, Boston) is also used. Lobby display screens advertising upcoming Museum programming. Main theater with custom drapery designed by Cindy Sirko. 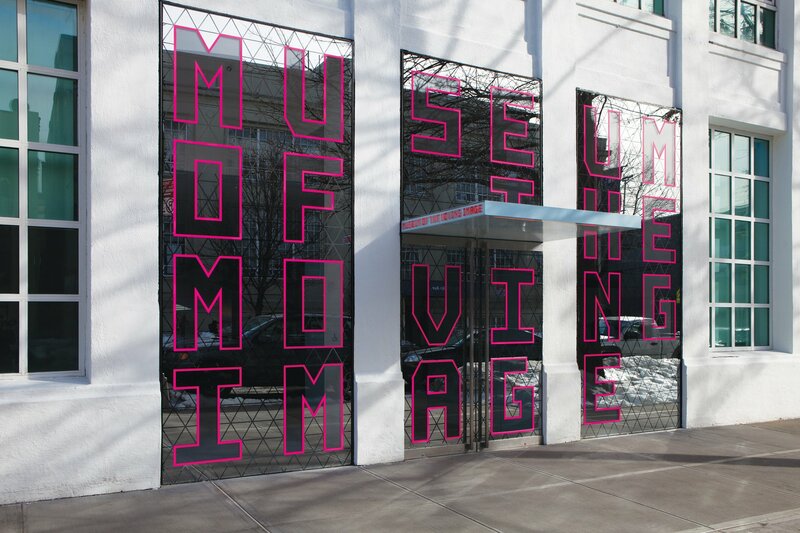 The Museum of the Moving Image sits on a tranquil tree-lined avenue in Astoria, Queens, a neighborhood that New Yorkers associate more with Greek food than with the golden age of silent film. Astoria may seem an unlikely locale for the only institution of its kind in the United States, but this quiet corner of New York City has long been an artistic hotbed. The Museum occupies one of the thirteen buildings that comprised Paramount Picture’s former East Coast headquarters where the first of the Marx brothers’ films were produced. Though Paramount has long since moved west, Kaufman Film Studios continues to produce film and television in the complex. In addition to a new entrance, a museum store, and a café, a 267-seat high-end theater and a 68-seat screening room were added. The core exhibition, “Behind the Screen,” received a complete technological and artistic overhaul. For changing exhibitions, a major new gallery and additional video art spaces were created. Typeface used for various elements of the Museum's rebranding.